Supported by Young Science Fund of National Natural Science Foundation of China (81601468) and Project of Science and Technology Commission of Shanghai Municipality (17411952200). Abstract: Objective To assess the computed tomography (CT) and magnetic resonance imaging (MRI) features of acinar cell carcinoma of pancreas (ACCP). Methods The clinical data of 5 patients with ACCP confirmed by operation or biopsy were retrospectively analyzed. Among them, 2 patients underwent CT plain scan and enhanced scan, 2 underwent MRI plain scan and enhanced scan, and 1 underwent both CT and MRI plain scan and enhanced scan. The clinical data and imaging features of 5 patients were analyzed. Results The tumor of 1 case occurred in the uncinate process of head of pancreas, and 4 cases in the tail of pancreas. The maximum diameter of the lesion was 44.6-142.3 mm, with an average of 86.14 mm. The density or signal of tumors was not uniform in the 5 patients. Hemorrhage, necrosis and calcification were found in 1 patient, while the other 4 patients only had necrosis. The tumor capsule was intact in 1 case, with tumor located at the head of pancreas, and the capsules were incomplete in the other 4 cases. The enhancement of tumors in the 5 cases was lower than that of normal pancreatic parenchyma and reached the peak value in portal vein phase, and the tumors of all cases had internal necrosis. The patient whose lesion located at the uncinate process of pancreatic head had dilatation of pancreaticobiliary duct. 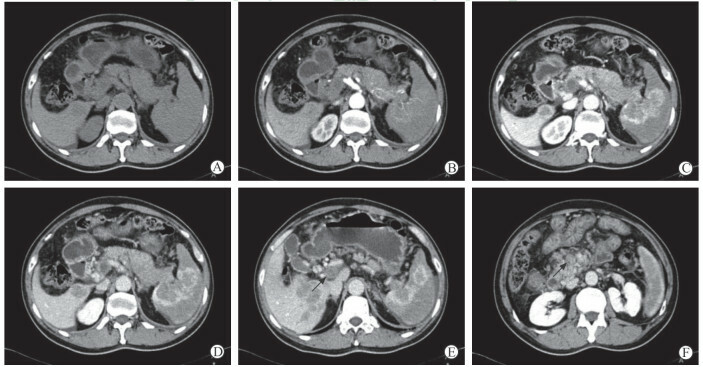 Four tumors located at the tail of pancreas invaded splenic vein, and 2 of them had hepatic metastasis. Conclusion ACCP is characteristic on CT and MRI images, which is helpful for diagnosis and differential diagnosis. 许壮勇, 曾向廷, 林黛英, 杜光舟. 胰腺腺泡细胞癌的CT、MRI影像特征[J]. 现代医用影像学, 2017, 26: 284-286. 王金花, 谭婉嫦, 刘立志, 李立, 靳仓正. 胰腺腺泡细胞癌CT、MRI诊断[J]. 中国CT和MRI杂志, 2013, 11: 65-67. 霍丙胜, 孙金锋, 郎岩, 师艳敏. 胰腺腺泡细胞癌的CT和MRI诊断[J]. 影像研究与医学应用, 2017, 1: 138-139.